Our round Essex dining tables are available in 30", 36", 42", 50" and 60" diamater sizes and all tables are 29"H. . Each table comes with an umbrella hole and plug (a 1 1⁄2" hole for the 36", 42" and 50"; a 2" hole for the 60") and room for our umbrella bases. The table tops are slatted for rainwater to drain easily from the surface. The Essex tables will comfortably accommodate all of our dining and armchairs. Please choose the table size from the drop down menu. Click on images for greater detail. * The table is pictures with Kingsley Bate Classic Dining Side Chair and Kingsley Bate Classic Dining Armchair. 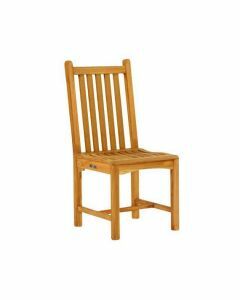 Click here if you wish to buy Kingsley Bate Classic Dining Side Chair. 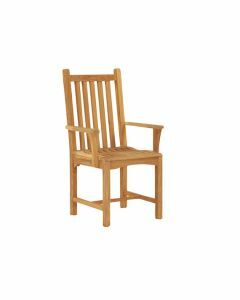 Click here if you wish to Buy Kingsley Bate Classic Dining Armchair.